Rizzle Kicks paid homage to one of their biggest musical influencers and idol, Bob Marley, as they made a special cameo in the conceptual TV ad for the release of his definitive album ‘Legend’. 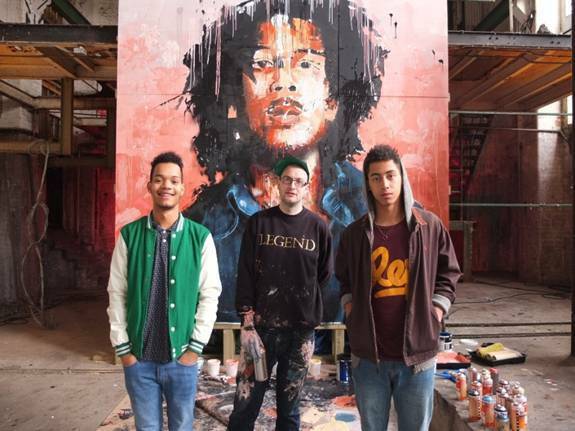 Rizzle Kicks joined critically acclaimed graffiti artist Alex Young on the set of the ad shoot as he was filmed creating a giant mural of musical legend Bob Marley in a London warehouse over the space of 10 hours. A time-lapse film will be created from the footage of Alex at work as the 12 feet Bob Marley creation is brought to life over the course of the day. Paying witness to the remarkable talent and creation of the Bob Marley masterpiece, the band has huge love and admiration for Bob Marley: “Bob Marley is a legend and a big musical influence of ours. We both grew up listening to his music, he definitely inspired and encouraged us to be the artists we’ve become today.” For Alex Young, this commission follows on from a string of critically acclaimed works. As the founding member of Brighton’s world famous Heavy Artillery Crew, Alex’s style is instantly recognisable, displaying an underlying sense of powerful graphic attitude, an artistic anger formed in his early years as a graffiti writer on the streets of London.